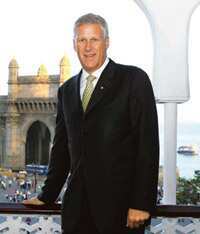 Mumbai: Louis R. Chenevert, president and chief executive officer of the $59 billion (Rs2.73 trillion) by sales, Connecticut-based United Technologies Corp. (UTC), that makes Pratt and Whitney aircraft engines, Otis brand of elevators and Carrier air conditioners, is committed to expanding the firm’s business in India. Like many other chief executives visiting India, his business card is printed in Hindi on one side. “We hope to do more of manufacturing here in India," said Chenevert, because “India is just a blip". However, the company’s slow growth in India is curious, especially given its history: In 1898, the first elevator in India was installed in Kolkata by US-based Otis Elevator Co., which UTC acquired in 1976. In 1960, it supplied engines to fly Boeing 707 aircraft, and in 1954, it sold transport helicopters to the Indian Air Force. Today, UTC has 4,000 employees spread over three factories and 113 offices at 60 locations in India, but India currently contributes only 1% to the firm’s revenue while China accounts for 5%. “In India, we will have double-digit contribution from a larger piece of portfolio and we have the demographies in our favour," Chenevert said in the course of an interaction that involved an interview and e-mail exchanges, adding that he sees “many opportunities in India, both as a market and as a bigger part of UTC’s global supply base". To that end, Chenevert makes at least two week-long trips to India annually, primarily to meet suppliers. On his most recent trip, in October, he met Prime Minister Manmohan Singh to discuss technologies available to reduce energy consumption and increase energy efficiencies, hosted dinner for his suppliers and vendors, and sewed up a new business joint venture with the Tata group to make cabins for UTC’s S-92 helicopters. UTC is constantly examining what products and components it can make outside the US, closer to its customers, Chenevert said. “The partnership with Tatas is an example of how the company will look to create partnership and develop suppliers in India to grow revenues." He also has good reason to spend more time in India and China. Orders from global market have substantially stabilized, although at lower levels, and the company has started to see improvement in some Asian economies, notably China, he said on 20 October, after UTC’s third quarter revenue dropped by 11% to $13.4 billion. Fresh sales in India will be driven by its products as the country lays railway lines, builds refineries, airports, metro rail networks, and as people migrate to urban centres, Chenevert said. The Prime Minister has endorsed the Planning Commission’s target of adding 10,000km of railway tracks annually for the next 10-12 years. The Airports Authority of India, too, has decided to upgrade at least 35 non-metro airports and build at least a dozen new airstrips across the country. “Growing UTC’s Indian supply base is important to UTC’s effort to increase its spend with low-cost suppliers since the company purchases 75% of the components in our products from its supply base," Chenevert said. It makes Carrier air conditioners in its Gurgaon plant and has 1,000 engineers working at its research and design centre in Hyderabad. In addition, UTC has multiple customers for its Pratt and Whitney engines. Air India, Interglobe Aviation Pvt. Ltd and Kingfisher Airlines Ltd all use Pratt and Whitney engines to fly their planes. Contracts for planes and engines are given separately. Besides, he said, India is on top of a growth opportunity and when such a market is growing in double digits, UTC needs to be there. “This agenda was important to me." he said about his November visit to India, even as UTC was in the last mile of an acquisition of rival General Electric Co.’s security business. “Our approach in India will be similar to the approach we have taken in China, where we have more than 40 partnership and joint ventures," he added. The joint venture with Tata group will make 30-40 helicopter cabins annually besides aerospace components from a facility in Andhra Pradesh that will employ nearly 300 persons, said Mick Maurer, Sikorsky Aircraft Corp.’s senior vice-president (operations), who accompanied Chenevert to India this month. Sikorsky, owned by UTC, manufactures aircraft. The venture is the first after the Union government announced its defence procurement policy on 1 November which allows India’s private sector firms to form joint ventures or alliances with foreign partners to jointly produce or bid for domestic defence contracts. The policy requires the joint venture to make at least 50% of the equipment from local firms and India’s offset policy requires foreign manufactures to source 30% of all defence import deals worth at least Rs300 crore from Indian companies. “The key to successfully develop cost effective products is to have a cost-competitive supplier base in India without compromising quality," said Manish Mathur, principal, AT Kearney India, a global management consulting firm. He points to the example of Maruti Suzuki India Ltd, India’s largest passenger car maker, and Hyundai Motors India Ltd, the largest exporter of passenger cars, both of whom have localized their components by bringing global vendors closer to their plants through joint ventures with Indian partners. “Such ventures use a mix of technology from global vendors and cost competitiveness of Indian partners to make components for the company’s global market." As part of the joint venture, UTC, a minority partner, will ramp up volume and expand its products and will eventually assemble all the components for these choppers. “We are not just making helicopter cabins for Indian market, but the global market," said Chenevert. Revenues from components, design, maintenance, repair and overhaul from India will nearly triple to $3.9 billion by 2014 from $1.4 billion in 2007, according to global consulting firm Frost and Sullivan, in an 18 March report titled Outlook for Commercial Aviation Supplier Market Outlook. “India is a large helicopter market," said Chenevert, betting on urbanization driving demand for elevators, air conditioners and helicopters to connect places that don’t have landing strips. According to Chenevert, 950 million Indians will reside in urban areas in 2050, up from the current 200 million. “We have energy-efficient solutions that will reduce energy consumption by 70%," said Chenevert. “For example, Otis sells an elevator that ploughs back energy from the elevator movement back to the system that reduces energy consumption by 75%. It also sells a non-ozone chiller that saves energy by 40%." Chillers are refrigerators that can maintain sub-zero temperatures for large quantity of goods such as medicines and meat. UTC will set up a new office in New Delhi with three managing directors for each business, said Jothi Purushotaman, who heads UTC’s India operations and will be responsible for the firm’s global strategic sourcing initiatives. But the firm also has some catching up to do. Rival General Electric, that built the first hydro power plant in Karnataka, earns $2.6 billion revenues from India—at least five times that of UTC’s—with $1 billion from product exports and services alone. Similarly, Honeywell International, the world’s largest maker of aircraft controls, has recently developed a next-generation flight management system that was created by Indian engineers. However, UTC is banking on a low-cost supply chain to support growth and to leverage its solutions portfolio. The way he sees it, there’s only one thing to do. “My challenge is to go fast as I can," said Chenevert.